Welcome to the Dragonwell family, Terry! So glad it’s finally out so I can read it! 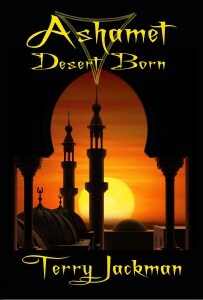 Dragonwell Publishing is thrilled to announce the upcoming release of Ashamet, Desert Born, by Terry Jackman, and with it its beautiful cover! All Ashamet wants is the warrior life he already has. But then a divine symbol appears on his arm, closely followed by an attempt on his life. Now nothing’s simple any longer, even less so when a new and very foreign slave seems shocked by both his new surroundings – and his master’s amorous attentions. Could this innocent young male hold the key to Ashamet’s survival? And to his heart?